Once in Santiago, the pilgrims, now with the Compostela in their pocket, face the return journey home. There are several options available that we detail in Vivecamino. Lavacolla Airport is the most important in Galicia. It has international connections with London, Dublin, Paris, Frankfurt, Basel, Zurich, Geneva, Bergamo, Istanbul, Madeira and Caracas. Within Spain flights depart to Madrid, Barcelona, Menoría, Palma, Ibiza, Alicante, Valencia, Malaga, Seville, Bilbao, Tenerife, Gran Canaria, Fuerteventura and Lanzarote. Lavacolla Airport is located eleven kilometres from the city. To arrive, the intercity bus collects passengers every half hour from several bus stops at strategic points in the city (San Lazaro, bus station, Avenida de Lugo and Doctor Teixeiro). Tickets cost three euros. The service starts at 07.00 and ends at 01.00. For more information call (+34) 981 563 238 or see the website of the company Freire. Another option is to go by taxi. The fare is 21 euros. Radio Taxi Santiago (+34) 981 569 292. The Galician capital is connected by rail to major Spanish cities such as Madrid, Barcelona and Bilbao. Pilgrims returning south of the Peninsula will have to make a stop in Madrid. From Vigo it is possible to connect to the railway network of Portugal. Prices vary depending on the destination. 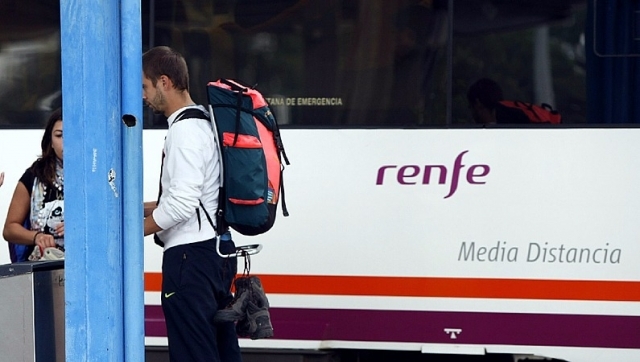 Check prices and timetables on the Renfe website or phone (+34) 902 320 320. The train station of Santiago de Compostela is located in the new area of ​​the city (Hórreo, 75). Most people walk to the station, however many of the city buses stop close to the station, take bus number 6 from the Plaza de Galicia. Another possibility is by taxi. The company Alsa covers the line Santiago-Madrid from 47.46 euros. Apart from to the Spanish capital, there are direct buses to Gijon, Bilbao, Irun, France, Portugal, Belgium, Switzerland, Portugal and Germany. Check prices and schedules on the web. Santiago bus station is situated on San Caetano Street, relatively close to the historic city centre. Many of the city bus lines in Santiago stop close to this point. Take bus number 5 from the Plaza de Galicia. Another of the most common options used by pilgrims to return home is to rent a car. The main companies in this sector are (Atesa, Hertz, Europcar and Avis) they have offices in Santiago de Compostela. Correos offers a packing and shipping service for bicycles. The price is 42,03 euros (VAT included, shipping to mainland Spain). This is available in all offices. The courier company Seúr also offers this service for 49,99 euros plus VAT. Bicicletas Oliveira is a shop specializing in the world of two wheels and they offer support to pilgrims visiting the Galician capital. They also have a special service for packing and shipping bicycles. For more information call (+34) 981 523 306. Those wishing to return by train without dismantling their bike should be aware that the train company Renfe allows only a certain number of spaces, therefore it is advisable to book a ticket for the transport of a bike as soon as possible. This service is only available on regional trains. By bus, only on national journeys, usually a supplement fee of 10 euros is charged.